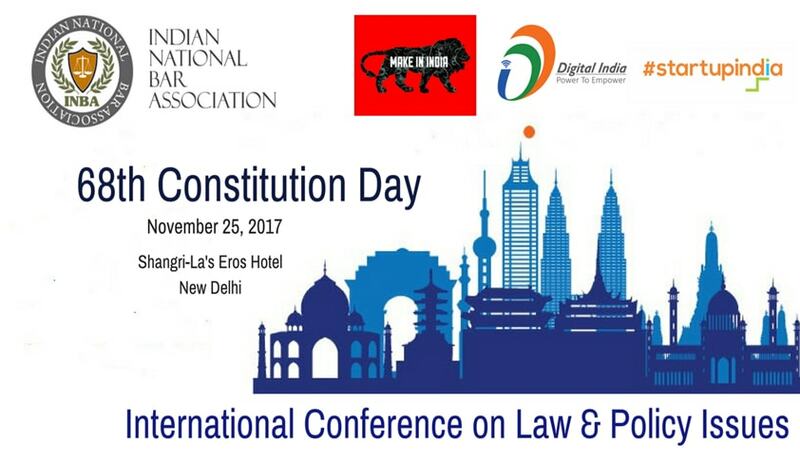 To coincide with the Indian Constitution Day celebrations, the Indian National Bar Association (INBA) will host its 6th annual international conference titled ‘68th Constitution Day’, at The Shangri-La, Eros Hotel, New Delhi, on November 25. The participants profile at ‘68th Constitution Day’ ranges from Federal & State Government officials from India and abroad, senior lawyers, consultants, entrepreneurs, general counsels, CISOs, officials of Fortune 500 companies & CEOs of businesses from large corporations to small and medium enterprises. Each year, INBA felicitates individuals, in-house counsels, law firms and subject experts who performed exceptionally well in their respective fields. After 2 successful editions, INBA is announcing its 3rdedition of awards on 68th Constitution Day under various categories of excellence. Distinguished jury comprising Ram Jethmalani, Subhash Chand Kashyap and judges of the Supreme Court of India will evaluate the worthy candidates based on their achievements. Queries may be addressed to Archana Aggarwal at archana_aggarwal@indianbarassociation.org or +91-9971532995 / 8285710651. You may also write to contact@indianbarassociation.org, or call +91 (011) 49036141. Further details about the conference and the awards can be found in the 68th Constitution Day brochure. The agenda for the conference can be found here.